Using Texas's best homegrown fruit. I can still remember the first time, after a long road trip through the midwest, my father pulled off the side of some forgotten highway in Texas to show my brother and I one of his favorite fruits—the prickly pear. We reached our arms through the barbed wire fence to pluck a couple of the cactus fruit from a small plant just on the other side—carefully, of course. After my father removed the skin, taking care to remove any barbs, we bit in. Prickly pear has a marvelous flavor. It's a wonder it isn't used more, especially since it grows on practically every roadside down here. 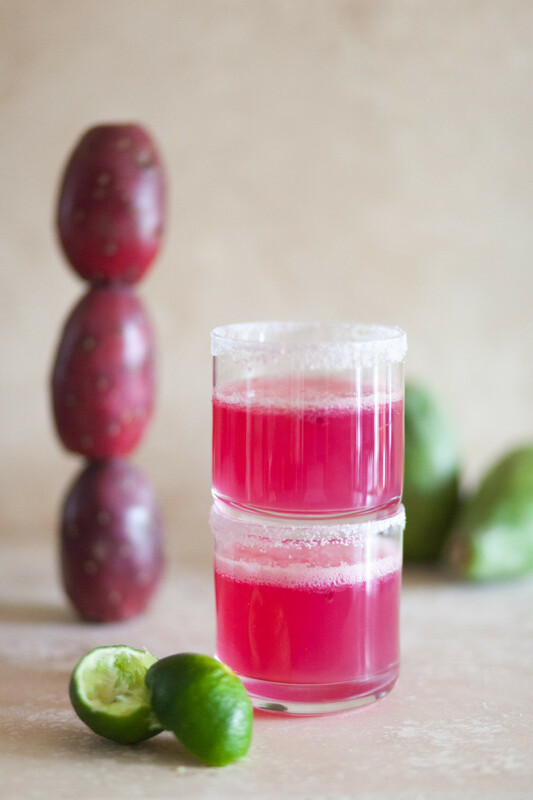 Prickly pear syrup also happens to pair with tequila wonderfully, making one of my all-time favorite margaritas. If you can't find prickly pear syrup or juice in the store, simply find a prickly pear and puree the fruit. Run the cut edge of a lime along the edge of a glass. Sprinkle some salt on a place and dip the glass into the salt to create a salted rim. Set aside. Add the tequila, prickly pear syrup, orange liqueur, and lime juice to a shaker filled with ice. Shake vigerously until combined, about 30 seconds. Pour into a glass and serve.